It is our needs that interpret the world; our drives … Every drive is a kind of list to rule; each one has its perspective that it would like to compel all the other drives to accept as a norm. The true world is unattainable, it cannot be proved, it cannot promise anything. 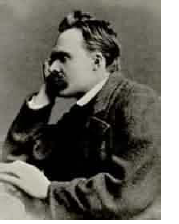 Nietzsche, Friedrich. 1901 (1968). The Will to Power. New York: Vintage Books. p. 267. —. 1873 (1954). ‘On Truth and Lies in the Nonmoral Sense.’ in The Portable Nietzsche, edited by Walter Kaufmann. New York: Viking Press. p. 45. —. 1888 (1915). ‘Twilight of the Idols.’ in Complete Works of Friedrich Nietzsche, edited by Oscar Levy. Edinburgh: T.N. Foulis. p. 24.